Don’t forget to Save the Date (Jan 26th) for Dinner Dance 2019! If you’ve ever coached in the Club, think that you may in the future OR may simply find yourself giving another person’s child a lift to or from the Club then YOU MUST BE GARDA VETTED. Aideen will then send you a link to a simple form that needs to be completed — and that’s it! This is a vital piece of admin that everyone in the Club with any contact with our younger members needs to complete. A cohort of Scoil members graciously accepted an invite from Lord Mayor Niall Ring to join him for a social evening the Mansion House on Saturday. Full pictures from the evening (thanks to our ever reliable roving reporter Niamh Farrelly!) 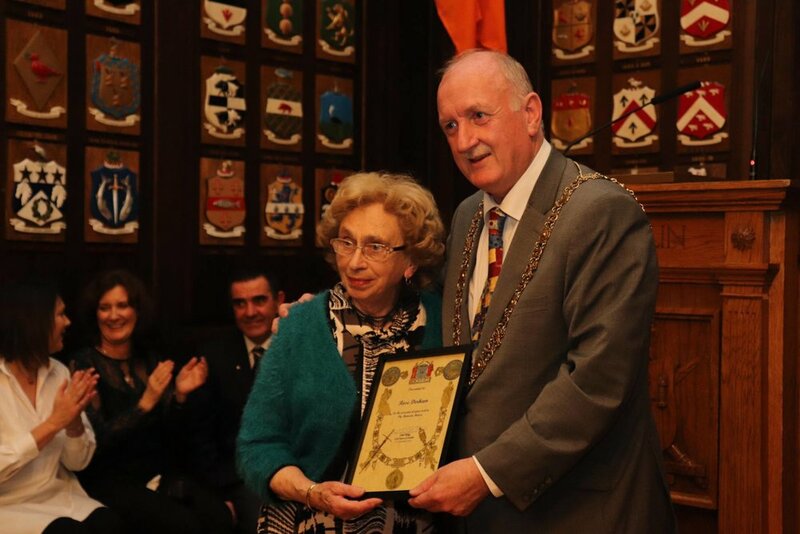 can be seen below, but of note see here Màire O’Connell’s Aunt Rose as she was presented a commemorative scroll by the Lord Mayor to recognise her Father’s role in the 1916 Rising. Máire’s grandfather Michael Derham’s name can actually be found on the 1916 plaques in both the Clubhouse and OCS grounds. 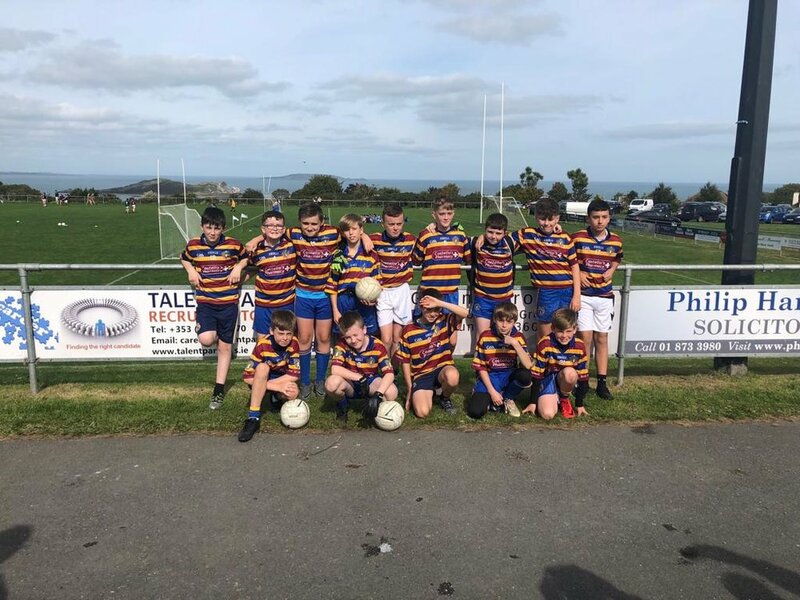 Congratulations to the Scoil & O’Tooles combined minor team (St Paul’s) who progressed to the championship final after beating St Peregrines on Sunday, in a tense affair which saw lots of drama. Read the full match report in Team News below. The final will be against Ballyboden on Sunday November 18th — time & venue TBC. Please keep an eye on Scoil social media for fixture updates as the County Board are chopping & changing fixtures regularly. As it stands the AFL7 Footballers, AHL9 Hurlers & Minor Footballers are all due to play Sunday Nov 11th but this will likely change. Màire O’Connell has kindly offered the below steps to all those who wish to contribute to the Christmas Shoe Box Appeal. Màire will be in the Clubhouse on Saturday November 10th to collect the shoe boxes. The u9 coaches’ attention is already turning to 2019! We believe that we have the makings of a super squad, but have room for a few more players. If you have a school friend, neighbour or relative who was born in 2009, bring them along for fun, friendship and fitness. If they have tried other clubs in the past and didn’t fit in, they will find our club and team culture completely different to larger clubs. Alternatively, if they have not played GAA previously, we will devote time and attention to help develop their skills. So, please tell John or Cormac if you know anyone who was born in 2009 and might be interested in joining our team. Which group in Scoil Uí Chonaill are you shining the spotlight on? How often (and when) does the group meet? What is the goal / purpose of the group / activity? What drew you to this group, or what do you think is it's biggest selling point? Imagine the Club is a family, and your group is a family member - where does this group fit in to the family tree? Are there any particularly quirky characters in the group worthy of a mention? What is your favourite memory of the group / activity? Probably last weekend where we beat top of the table Raheny in Hurling - giving us the top spot with one game to go! What is the funniest thing that has happened within the group? What is the group's greatest achievement? Maintaining a team all the way up to U12 has been a huge challenge with small numbers - now we’ve a great group of kids challenging in both football and hurling! If the group was a person, how would you describe their personality? If other Club members could do one thing to help your group thrive, what would it be? Podge Naughton has been a massive help mentoring the kids(& coaches!) in hurling - we all get lots from it! Would be great to have something similar in football consistently with a senior player. Would also work well across all teams. What is the beyond-your-wildest-dreams ambition for this group? Seeing as many of them playing senior football & Hurling for Scoil in 6 years time would be great....& we’ve a future Dublin player within the group - I know it! Describe the group in 3 words. Ambitious. Resilient. ... & Funny! Is the group seeking new members? If so, please let readers know how they can get involved. We’re forever looking for new players - get in touch! Want your group to feature next? As a Club, we really pride ourselves on the close-knit community that we have at Scoil Uí Chonaill - help us in our effort in getting to know all of our members by filling out the below questionnaire on behalf of your group or team! It’s that time of year again! Juvenile membership payments are now due for the 2018/2019 season. You can easily make payment on the Scoil website, as well as complete the membership questionnaire. The Club would like to extend a big thank you to Tom MacNamee who will be stepping down as Senior Football Manager with this season’s end. Tom worked tirelessly over the past year and his impact will be realised for many years to come. Best of luck Tom! U10 Boys celebrate first home tie in a while with a win! Scoil's u9s put on a great display on Saturday where we saw all the practice of the past year on show. We started well playing into the breeze with early scores from Sean Downes & Feargal O’Connell. We kept the score board ticking over with some great points from David Kennedy & Conor Moran & a goal from Robert McBride meant we were ahead at half time 1-8 to 0-7. Second half was hard fought and very tense, peregrines weren’t going to give up easily. We took some really well worked scores from Robert McBride, David Kennedy & Sean Taaffe but 2 soft goals & a few questionable refereeing decisions meant this went right to the wire. Peregrines had a goal chance in the last minute in a goalmouth scramble that we managed to clear - that would have leveled the game. Heart in mouth stuff! Lads showed great resilience to deal with a lot of problems on the pitch & great self belief to win out. David Kennedy put in a man of the match performance scoring 5 points from midfield at critical times. Robert McBride scored a hugely impressive 1-4. Good performances too from Ian Hattaway, Adam Nolan, Josh Fitzpatrick, Jordan Dunne, Kealen Donohoe, Sean Downes, Peter Cronin & Ben McDermott. David Kennedy 0-5 (2f), Conor Moran 0-2, Robert McBride 1-4, Sean Taaffe 0-2 (2f), Sean Downes & Feargal O’Connell 0-1. The boys finally played a home football game on Saturday it was against St Peters. Despite the mid term break we for 13 kids out (with a little help from Noah and Sean from the under 9s). The team performed solidly and had an impressive win by a score of 4 goals and 5 points to St Peters 2 goals and 1 point. Rys scored two great goals from close range demonstrating his value as a forward. Ruairi scored a goal which looked as though it was going over the bar but just dropped into the goal over the keepers head. We had a very impressive long range point from Conor Meehan, a great close range point from a very tight angle from Callum who scored as a result of sheer perseverance and a great chipped point off the ground from Noah. The defence of Isaac, Luke and Evan with Cillian in goal contained the opposition well in the second half with strong midfield performances from Jake, Temi and Conor Kelly who won a lot of ball in midfield. What was great to see was intelligent use of the ball always looking for a team mate to pass to when there were no kicking opportunities. We will have a couple more games before the Christmas break. The standard of the Maroon team’s tackling and passing was first rate. It was great to see our players attacking at speed and looking up before passing to a teammate in a better position. Brodie had a super game for Scoil in the first half and O’Dwyers in the second half. He kicked a number of long accurate passes to put both teams on the attack - and scored a number of excellent points (for both teams!). His second half display was so forceful that he was top scorer for O'Dwyers on the day. Sam had another super game and defended with all the shouldering and tacking skills that we have been practicing. After winning possession, he burst through his opponents before passing to teammates. Jake was on fire in the forwards. He will become unmarkable if he keeps running into space for passes and finishing with such skill and accuracy. A huge thanks to Noah, Caleb, Conán and Brodie who all kindly agreed to play with O’Dwyers at different stages. For the Yellow's Aodh was a dominant force covering acres of ground and getting his team on the front foot. It's hard to believe Zach has been only playing with Scoil for a few months. His influence on matches increases every week and he's adding endurance and skill to his gymnastic agility! Danny and Eoin chipped in with some great scores, while Darragh and Hugh defended stoutly. Cian B too marked well and often found himself in the right place at the right time. Finally, the Blues were involved in a superb game where both teams took some great passing scores. Cian H was tireless getting up and down the pitch and some of the give and goes he and Conall played were a joy to behold. Oisín was a strong presence at the back and he made many long relieving kicks in the first half to Fionn and Orson who tirelessly found space. The second half of football was the best half that many of these kids have ever played for Scoil and the platform was provided by Tadhg in goals. Rory Beggan had nothing on him as he calmly gathered the ball and forayed into space to set up Scoil attacks. He was ably protected by Rian who committed to tight marking at all times. The game was tight as Orson showed a great bit of agility to catch and turn his marker only to fire a great effort just wide. But as the referee looked at his watch, Conall sold a great dummy to send his marker the wrong way. Having spent plenty of time practicing his solos this year he was able to accelerate away and, as the referee put the whistle to his lips, he split the posts for the clinching point. There have been some huge advances in skill levels in recent weeks and the coaches are organizing a few more friendlies to keep the momentum going. Keep practicing at home. High catches with ball and sliotar are currently on the curriculum! One final note of thanks to Declan Hoban on the great job of organizing refs for us throughout the year. It's very much appreciated. 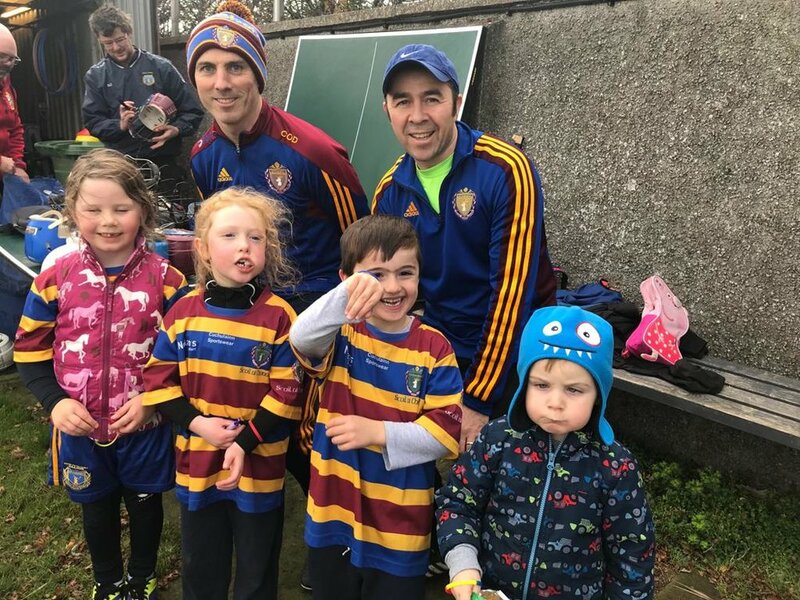 The Under 7’s ( Blues) played at home last Saturday against Howth in Hurling. There were 2 teams from each club with some Scoil players also playing for Howth due to the great turn out of the players. The rain held off and all teams played well with evidence of the players beginning to stay in their allocated positions and some great scores from the forwards. The matches were tight with good evidence of tackling from the Scoil players who were not being afraid to get stuck in. A few players get a particular mention for their extra effort- Simon, Mallick, Jason, Rory, Bill and new to the team Sam. Also thanks to Tyler and Shane for playing with Howth. The coaches were enthusiastic throughout so much so that the local referrer had to remind them of the pitch boundary on one occasion. We look forward to playing Howth in Football in a couple of weeks. Meantime back to training this week in Larkin College on Monday evenings and Scoil Ui Chonaill grounds on Saturday morning.